Inspiration is fickle for me. It’s difficult for me to sit down and think of something to write about. It never works that way. It makes it really hard to plan blog posts ahead of schedule when my blog is mostly based on inspiration. I could be watching a television show and a quote could really stand out similar to what happened in Ornamental Relationships. Or I could be engrossed in a conversation via Twitter about crappy dates and The Red Lobster Date evolves. Oh, and let’s not forget the times where I just get a fragment of a thought. That’s the worse. The fragment may not ever see completion. Until then, those little nuggets of potential awesomeness just sit in my notebook, phone, and/or laptop, patiently waiting for their moment. Then you have the moments when inspiration hits and you have NOTHING available to record it. This always happens to me while I’m in the shower or driving. I end up having to repeat it out loud until I can record the thought(s). Trying to recapture lost inspiration is impossible and if I happen to grab a piece of it, it’s never the same as the first go around. Finally, I stockpiled my bathroom and car with Post-it notes are a tremendous help. No more forgotten moments over here. 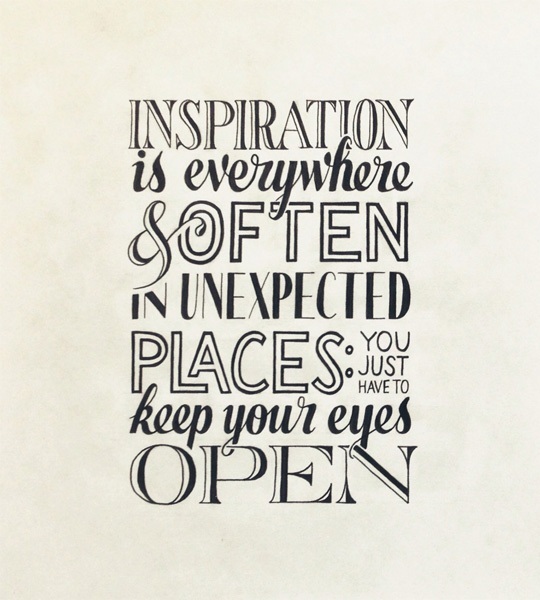 My fellow creatives, how does inspiration come to you? Is it easy for you to sit down and create? Or do you need to live and allow inspiration to come to you? Leave a comment so we can discuss.